A small girl is resisting bedtime. Although it might be bedtime for little girls, and even for little rabbits, it’s clearly not bedtime for some of her other onesie-inspired friends. Mum, who may or may not be planning a sit down with a mug of hot chocolate, is happy to play along. 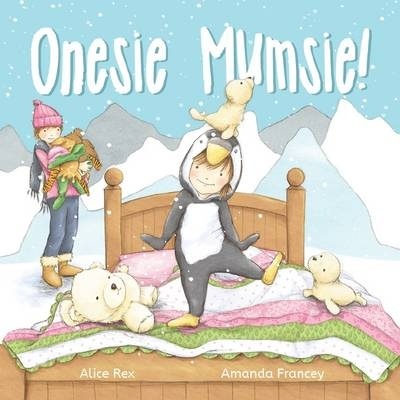 Illustrations move from the realistic to the imaginary as different onesies inspire imaginative play. Mother and child enjoy their play until it seems the little girl is finally content to stay in bed. Now Mum can also go to bed. Illustrations are watercolour and pencil, set mostly in white space, although there are hints about what ‘adventure’ will follow. Cameo roles are played by the little girl’s favourite soft toys. Onesie Mumsie! is a celebration of pre-bedtime games, a celebration of the one-on-one time that is so important for parent and child. The child initiates an activity and Mum rolls with it, joining in to vanquish the animals that appear on her bed. Cue cuddles, tickles and more. Young children will love the playfulness, and the illustrations offer an introduction to different habitats and potential discussions about animals and their habitats. (Tired parents might want to schedule reading to the weekend!) Recommended for pre-school children.